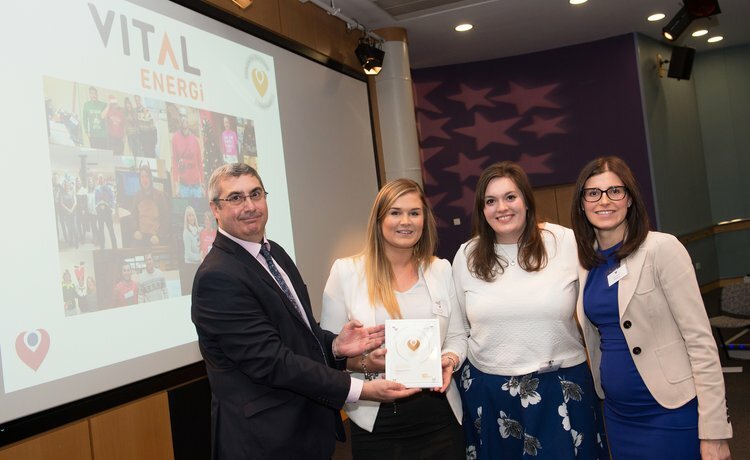 Vital Energi was recently invited to an awards reception by The Christie to celebrate over 10 years of supporting its efforts as a corporate fundraising partner and we were delighted to be presented with a ‘Dedicated to The Christie’ Gold Award. The event, held at The Christie’s Education Centre, saw a world-leading clinician explain how this support is making a real difference and The Christie revealed that it had raised over £1m from its corporate partners, which will go towards various projects and services including the development of a state of the art Integrated Procedures Unit and a dedicated research facility within the UK’s first high energy proton beam therapy centre which is due to open in 2018. The Christie charity supports the work of The Christie NHS Foundation Trust and is one of the largest NHS charities in the UK. It provides enhanced services over and above what the NHS funds. It has over 43,000 supporters, who helped raise £15.8m last year.